Are you ready to face off against stout Dwarfs, crafty Skaven, and ruthless Orcs, all to become Spike! Magazine’s Manager of the Year? 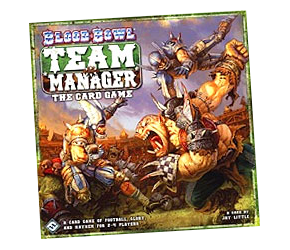 Blood Bowl: Team Manager – The Card Game is a card game of violence and outright cheating—oh, and football—for two to four players. Fantasy teams compete against each other over the course of a brutal season. Customize your team by drafting Star Players, hiring staff, upgrading facilities, and cheating like mad. Lead your gang of misfits and miscreants to glory. You can choose from six teams: the versatile humans of the Reikland Reavers; the short, tough, well-armoured Dwarven Grudgebearers; the athletic Wood Elf Athelorn Avengers; the sneaky Skavens of the Skavenblight Scramblers; the violent Orcs of the Gouged Eye; or the even-more-violent, cheating, and downright nast Chaos All-Stars. You have five weeks (or game turns) to groom your team for the final Blood Bowl tournament in head-to-head highlights—accumulating fans, gathering payouts and rewards and upgrades. Blood Bowl as a card game? You’d never think it would work, but it does. A great idea and lots of fun.